Sometimes you have to look a little silly to achieve your goals. 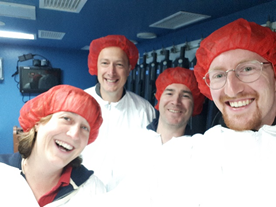 Here, the ‘Pelagic Team’ of the COMICS2 cruise is in the trace metal lab of the RRS Discovery ready to produce water samples that are free from trace metal contamination. One set of experiments of the cruise focuses on remineralisation of organic matter with a special focus on iron as a nutrient. On a ship built entirely of iron, contamination is a big problem. Therefore, the lab room is completely covered in plastic. Also, the CTD water sampler rosette is iron free and hanging on a wire with plastic coating. We too are a contamination risk for our samples, which is why we have to dress up with hairnets, plastic coats, lab shoes and double gloves. All equipment is acid washed to remove even the last bits of dust, and then double, triple or even quadruple bagged. This is my first big research cruise and I find it especially impressive how many people have worked together to make this cruise and these experiments possible. It’s a fantastic chance for me to learn hands on oceanography in a great environment like here on the RRS Discovery. That’s it for now. I will write about my own project later when I have selected a nice foraminfera picture for you.